First-time director Mozez Singh's Zubaan has a marked similarity with its male protagonist. Both are unsure of the trajectory they desire. Inevitably, the lack of direction frequently leaves the film and its pivotal character in a limbo. At the heart of Zubaan is an all-too-familiar figure: an underdog who wages a battle against his own doubts and inadequacies, straying dangerously close to losing his moral compass in the bargain. So novelty isn't the strong suit of this well-intentioned but uneven film. The director - he wrote and produced the English-language White Noise in 2004 - seeks to offset the handicap by packing in a range of generic elements aimed at livening up the tale. A few work, a few don't. The hero (Vicky Kaushal), a Shabad Gurbani singer's son in Gurdaspur, has a stutter. His salvation lies in song. But the man has either ideas. He wants to live up to his name, Dilsher. He aspires to be 'lion-hearted'. And his ambition leads him astray. That, in a nutshell, is what Zubaan is about. But just as the blemished protagonist goes from being a diffident rustic schoolboy to a cynical urban manipulator, the film frequently veers off its coming-of-age track. Especially out of sync with the indolent rhythm of the drama is the male lead's hazily etched romantic interest, a singing-dancing Bohemian girl (Sarah-Jane Dias) who turns into his life-altering lodestar. Weighed down by a personal tragedy, she looks for solace in music and sundry unspecified intoxicants. Zubaan has the whimsicality of an independent film. But, to its own detriment, it is tempered with the random trappings of a Bollywood musical. The technical attributes are first-rate. Zubaan is beautifully filmed (cinematographer: Swapnil Sonawane) and Khyatee Kanchan's production design is impressive. The soundscape, too, is lively, with music composer Ashu Pathak coming up with a score that does its bit to shore up the story. It is the inconsistent storytelling that lets Zubaan down, making it a rather tepid saga that is desperately low on steam. The principal characters - all of them barring the flighty heroine are morally dodgy figures - exploit each other in the most obvious and predictable of ways. As a result, the twists and turns that their devious actions and revelations trigger are never startling enough. 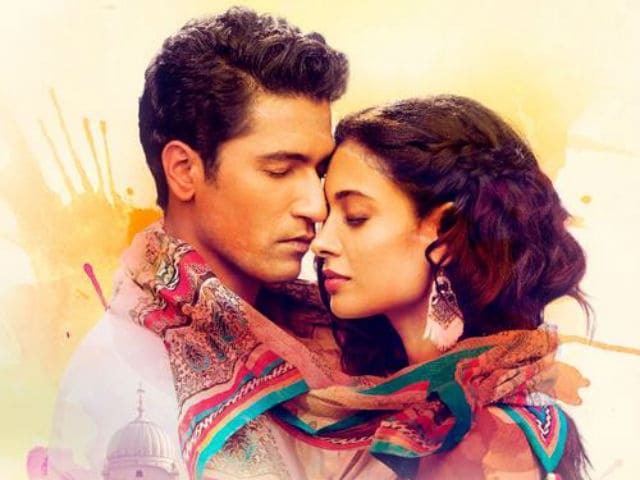 However, thanks to the unwaveringly focused performance by lead actor Vicky Kaushal, the film does not sink into outright drudgery at any point. Kaushal holds Zubaan together despite the many impediments in his way, most of them stemming from careless sleights of the screenplay co-written by the director with Thani and Sumit Roy. Dilsher is a bundle of contradictions. He embodies as much vulnerability as he does cockiness. His susceptibilities are couched in self-conscious swagger. Kaushal captures the nuances perfectly. Back in Gurdaspur, the docile Dilsher (Harmehroz Singh) is easy meat for village bullies. As the boy is pummeled, a brick-kiln owner, Gurucharan (Manish Chaudhary), watches from a distance. He does not lift a finger to help. But the stranger gives Dilsher sage advice. The only person you can turn to for help is yourself, he advises him. Gurucharan also gives the boy a pen so that he can write his own destiny. Eleven years later, a far less insecure Dilsher heads to Delhi from his village in search of the man who gifted him the pen. He quickly worms his way into the good books of Gurucharan Sikand, who is now a wealthy tycoon at the helm of a huge real estate empire. From this point on, Zubaan turns into a dysfunctional family drama, hinging on the mounting rivalry between Dilsher and Gurucharan's son Surya (Raaghav Chanana). The latter, envious of Dilsher's growing clout, has frequent run-ins with his "cold and unloving" dad, egged on by his mom Mandira (Meghana Malik). Zubaan resorts to none-too-subtle tics to take the drama forward. In one scene, after Dilsher is roughed up by a mystery man, Gurucharan reminds him that he has 'Punjabi blood' and should not, therefore, spare the culprit. On another occasion, Gurucharan orders that a fourth seat be placed at the family's massive dinner table for Dilsher. The act riles his wife and his son no end. A showdown ensues. But that isn't the only point that the sequence is out to make. It reveals Gurucharan and Dilsher eating with their hands, Mandira and Surya with chopsticks. The Gurdaspur pair inhabits a world apart although they all live under one swanky roof, got it? Reconciling the many contradictions in the character that he plays is a tough ask for Kaushal, but he does not let the strain show. Yet Dilsher, a young man struggling to find his voice and purpose in life, does not acquire a rounded feel because the writing is fitful and the directorial approach erratic. Besides allowing Sarah-Jane Dias far more play than is necessary, Zubaan also has considerable space for two other actors - Manish Chaudhary and Raaghav Chanana. Chaudhary is of course a proven quantity and has the presence to fill up the screen. Chanana is perfectly cast in the role of the corporate scion who cannot understand why his dad is averse to giving him his due. Zubaan stretches itself too thin at times in trying to raise its narrative tempo. In its quieter moments, however, it does manage to get its voice heard. Watch it for the latter bits - and for Vicky Kaushal.